Heading to Las Vegas for a fun family vacation? Perhaps a bachelorette party? Maybe you’re getting married there (I did!) and you’re looking for a fun activity for all of your wedding guests. 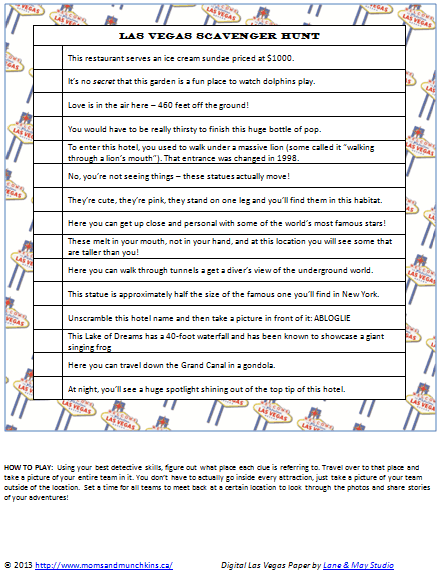 Well then I have something perfect for you – a free printable Las Vegas Scavenger Hunt! I rarely have a drink and I don’t gamble so why do I love Las Vegas so much? Oh, there are so many reasons! I love all of the beautiful hotels there with the gorgeous architecture and attractions inside. I love the outlet shopping and the specialty shops. I love the food…oh how I love the food! Although we haven’t traveled there with our son yet, my husband and I have been to Las Vegas multiple times and look forward to more trips in the future. I already have a list of all the attractions I want my son to see when we take him. It really can be a family-friendly vacation destination! This free printable Las Vegas Scavenger Hunt is filled with clues for locations on the Las Vegas Strip. It’s perfect for all ages so it’s a great family activity. It’s a fun way to see some parts of Las Vegas that you may not otherwise see plus you can discover some little-known treasures along the way! To print the free printable game, click on the picture of the game below and it will open up in a new window for you. The second page of the game has all of the answers. To play the game, split into a few different teams and give each team a copy of the Las Vegas Scavenger Hunt page. The teams then try to solve the clues and travel to each clue location to take a picture. Let the players know that every team member must appear in each of the photos. You don’t have to actually go inside every attraction (because that can be expensive & time consuming if you want to fully enjoy them all), just take a picture of your team outside of the location and make notes of the ones you want to return to later. Set a time to meet back at a specific location to look through the photos and share stories and laughter about your adventures. Hint: To save on time, it’s best to solve the clues before running to get your pictures so that you can set yourself a route that doesn’t require backtracking. What are your favorite family-friendly attractions in Las Vegas? For more family fun ideas & freebies, follow us on Facebook, Twitter, Pinterest and Bloglovin’. These competitions can begin your bankroll if you’re able to obtain a share of the award bag.